A government official in China said on Monday that the country is planning new punishments for local officials who don’t meet goals to decrease air pollution, according to Reuters — the latest sign that the country is serious about improving its environmental track record. 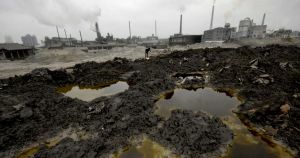 “For those who failed to meet the targets, we will hold them accountable publicly and local governments will need to come out with detailed punishment measures,” Liu Bingjiang, an official at China’s environmental ministry, said according to the news service. After the media zeroed in on the horrifying smog choking China’s cities about five years ago, the nation declared a “war on pollution” designed to fight climate change and improve air quality. China set ambitious goals, according to Reuters, that included cutting the concentrations of dangerous pollution-linked particulate matter in 338 cities. In some areas, government representatives have become suspicious that local officials are looking the other way as polluters continue to ignore new rules. In addition to punishing offending officials, China is also planning to role out new emission standards in the steel and coal industries.